Hi foodies..here am back with an egg less chicken fingers recipe. For those who want healthy finger foods for kids by your side with crispy crust , juicy moist inside and perfect kids party food..here it is. 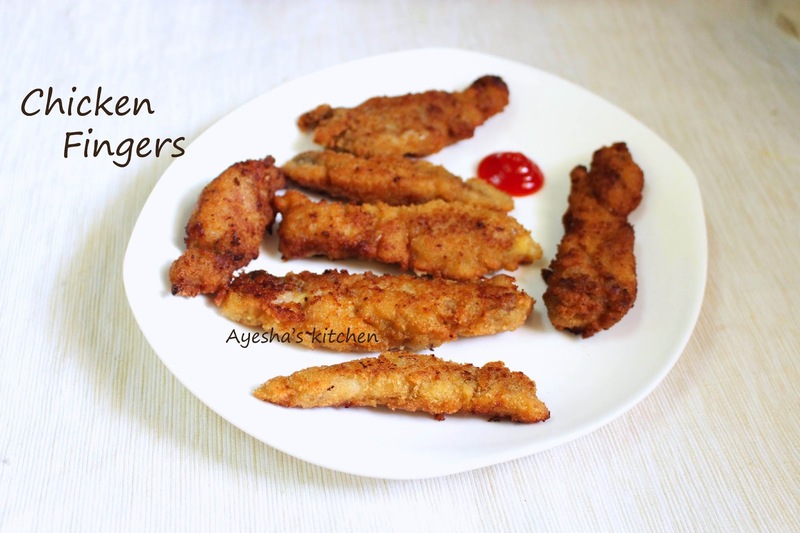 I made this crispy chicken tenders recipe using breadcrumbs (for coating). If you are looking for something new for enjoying your kids beautiful smile, then give this a try. Such recipes for chicken tenders will be less spicy (as it is kids finger foods) . This is a shallow fried chicken strips recipe that can also be deep fried instead. 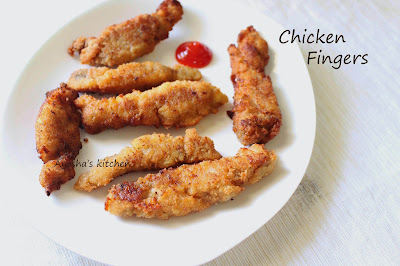 So lets see how to make this simple finger foods / simple chicken fingers at home. Marinate the chicken strips with pepper powder, soy sauce, oregano and salt. Dip each marinated strips in this flour batter and then coat well with the bread crumbs. Heat a pan with oil and fry until golden and crispy. You can also deep fry it in batches. Enjoy with hot chili sauce or tomato ketchup.